We have financed our development in Colchester of a home ownership cohousing through a mix of member and loan finance. This case study explains how we did that. We have financed our development in Colchester of a home ownership cohousing through a mix of member and loan finance. This case study explains how we did that. While vitally important, finance is just one aspect of a successful self-build cohousing project. Our website, newsletter and social media activities provide further information on the broader picture. As a group, we have had to find money in advance to purchase land, finance the design, planning permission and site preparations, and match the development loan. We have asked members for a minimum deposit of 10% of the estimated cost of each home, but encouraged those who are able, and willing, to invest more. 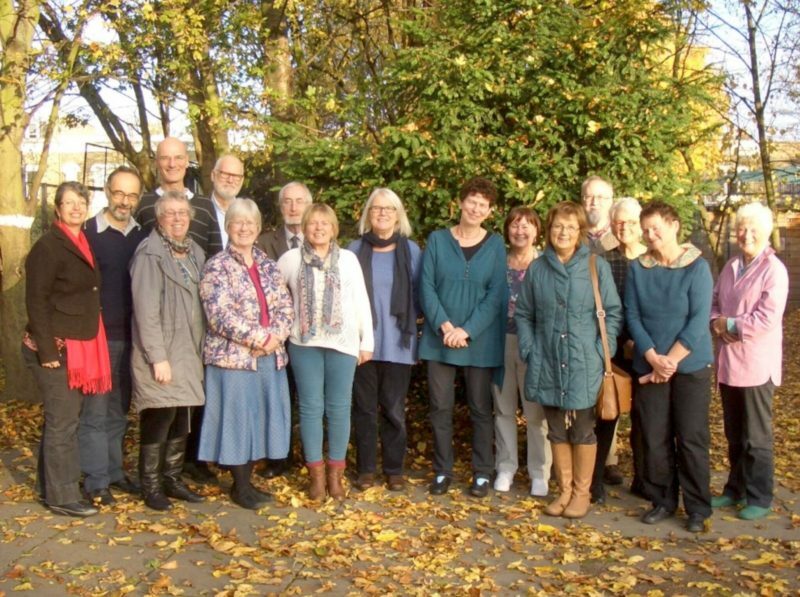 Collectively, Cannock Mill Cohousing members have been able to, in effect, advance more than half the money for their homes, leaving the remainder to be financed externally. The cash advanced has come from different sources: selling a property and either downsizing or renting, pension drawdown, or simply from having savings. Lenders need to get their money back and receive an adequate rate of return on that money. Low-risk borrowers can borrow at low interest rates; high-risk borrowers pay higher rates or don’t get a loan at all. External lenders confirmed to us that they are not impressed by cohousing groups with just big ideas. They see a self-build company with no track record. They don’t want to touch that sort of risk even if they have a boat house full of barge poles. So what did CMCC do to successfully attract development funding? There are three areas where CMCC was well prepared: we had a valuable site with planning permission, we had (and have) substantial funding commitments from members (we are over 50% self-funded) and we looked like serious business people (and indeed we are). We were able to impress in meetings through realistic business plans, cash flow projections, risk registers and impressive Board CVs. We even continue to run with two different types of CV: the external ‘scary’ ones and the ‘friendly’ ones – the latter are mainly for the benefit of prospective members. CMCC has been very fortunate in being able to draw on the professional skills of its membership, including housing finance and accountancy. While we have appointed a nationally recognised firm of tax advisers, the only professional area where CMCC has spent significant fees is on legal matters (have employed specialists, including Wrigleys – well known in cohousing circles). Of course, we also have Anne Thorne as a member, Anne is our scheme architect and we pay her firm the scale rates for their work. As members we wear two hats – as directors of the company and as people buying our own homes. Directors are required to act with reasonable care, skill and diligence in accordance with the company’s constitution, to promote the success of the company while having regard to the impact of decisions on stakeholders. As directors we have a collective responsibility for the good of the company. Tensions between our personal and director hats have been acknowledged and managed, for example accepting that a person’s ‘ideal home’ may not be possible because we have to keep to standardised designs to control costs. The prices of our homes remain uncertain until they are completely finished, because until then we don’t know the full attributable cost. The cohousing company is ‘not-for-profit’ so there is no buffer of a ‘developer’s profit’ to set prices in advance. In order for the project to proceed our members have had to accept the risk that budgeted prices may rise. This is more acceptable if the way purchase prices are determined (costs are shared) is fully understood and is equitable. At CMCC we have allocated costs, including the common house and facilities, by size of home, with some adjustments to reflect a valuer’s view of comparative market values of the finished homes. As a cohousing group we have agreed values and principles and we have accepted that these come with a financial impact. We have not compromised and all homes are being built to Passivhaus and Lifetime Homes standards. We accept the additional costs as necessary, in the same way that we accept that we have to bear the cost of the common house. We have structured the cohousing project in a way that individual homes will continue to be part of it, with continued obligations to contribute to communal running costs. Both flats and houses are being sold to members on 999 year leases. We have taken legal steps to discourage leaseholders from changing their tenure to freehold and to continue to collect a share of running costs from any freehold. Given current concerns over leasehold house sales, this may have to change, but we preferred it to commonhold, which is not yet properly developed in the UK. As leasehold properties, all our homes will be subject to a service charge. That charge will cover normal landlord’s expenses, such as insurance and maintenance, but it will also include an allocation of similar costs incurred on the common house. Service charges are allocated on the basis of property size. Because we collectively make the decisions on all attributable costs, we control the service charges, but we recognise they will be unfamiliar to those of us coming from freehold properties. If we do our own collective maintenance jobs it could keep costs down and we are expecting the energy cost savings from Passivhaus to help finance our individual service charges. We have come a long way, physically and emotionally and the end of our self-build is in sight. Indeed, the homes have a number, a street name and a postcode – they are 1 to 23 Cannock Mill Rise, Colchester, CO2 8YY. Our Cannock Mill site (two acres, with Grade II listed Cannock Mill) is actively being developed; we have some £2.5 million at the bank and a signed loan facility agreement with the HCA to provide sufficient funds to complete our development. This means that for those who join us now (we still have a couple of homes to fill) the project is (almost) ‘as safe as houses’ and no longer a journey for risk takers. As the above timeline shows, we spent several years trying to identify a suitable site and to grow and cement our group. In hindsight, we wasted time talking to a housing association, as the lure of having a developer apparently take all the financial risk was strong. In view of what unfortunately happened at Cohousing Woodside in 2016, it seeems that even that prospect was an illusion. 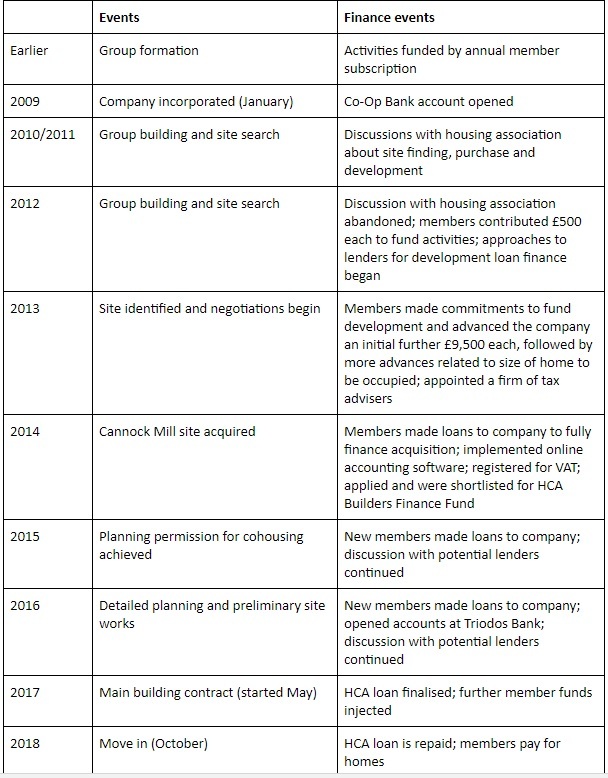 The ‘housing association’s agenda’ and ours never became synchronised: when we had enough members happy to work with the association, the right site was not on offer, and by the time it was, our expectations had changed due to a change of membership. In 2012, we began the process through which members made a proper financial commitment to the project. This process accelerated when we identified a suitable site in Colchester and, while we lost some members, the remainder of the group gained a greater sense of purpose and cooperation. Site purchase was a key moment; we knew we were potentially in competition with well-funded developers and that loan finance at that stage was virtually impossible. We had to have ready money in the bank in advance and the only way to do that was for members to lend the company sufficient funds. We recognised the need to recruit further members and to negotiate an external loan to fund the development. Members provided further funds to both impress potential lenders with our financial commitment (and reduce the lender’s risk) and limit the external borrowing and hence interest payments which otherwise add to the total cost. Sadly, we had to abandon our plans to include homes for rent as members could not collectively afford their capital cost or any affordability subsidy. In between that acceptance and the final signatures on legal agreements (2 May 2017) we (and HCA) had to work very hard on setting everything up. Because HCA wanted a charge over our assets as security, and because the HCA maximum loan would cover our needs, it became easier to concentrate on just this one external source of finance. The negotiations, preparation and completion of myriad legal documents and matching finance agreements with our members took place at the same time as we were achieving the planning permission we wanted for cohousing, doing preliminary works on site and appointing a developer for the main building work. Add in the implementation of new finance software, the continued work on communications necessary to recruit more members and the many day-to-day matters of building the group’s cohesiveness and you can see that, for some of us, the work has been almost a full-time job. Worth it though!